Jurassic World is only a month away and I am getting pretty excited to see it in theaters. Yes, I know, the dinosaurs are not really accurate...at all. But, as a movie it looks like it will be a lot of fun! 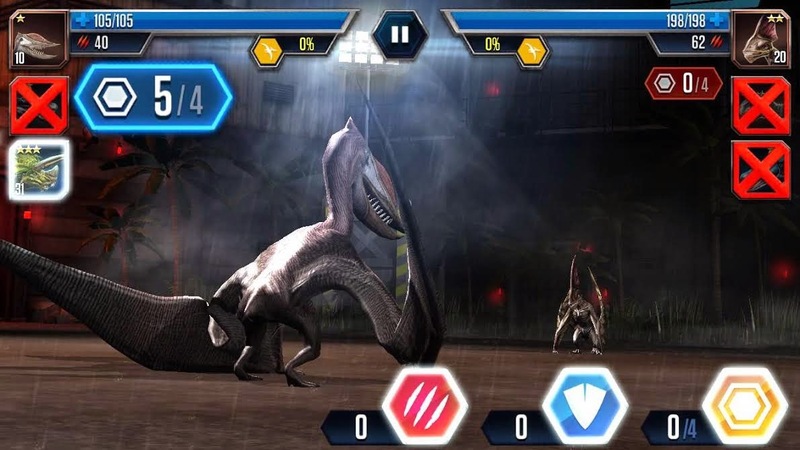 Just a few days ago I stumbled upon an add on facebook advertising a Jurassic World game for the iphone or ipad. It was free so I decided to download it and see what it was like. Let's check it out! 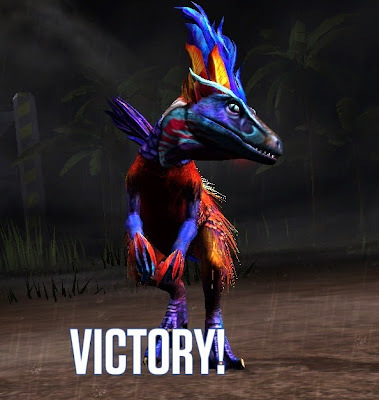 Jurassic World: the Game is sort of like a combination of Zoo Tycoon and Pokemon, as far as games go. 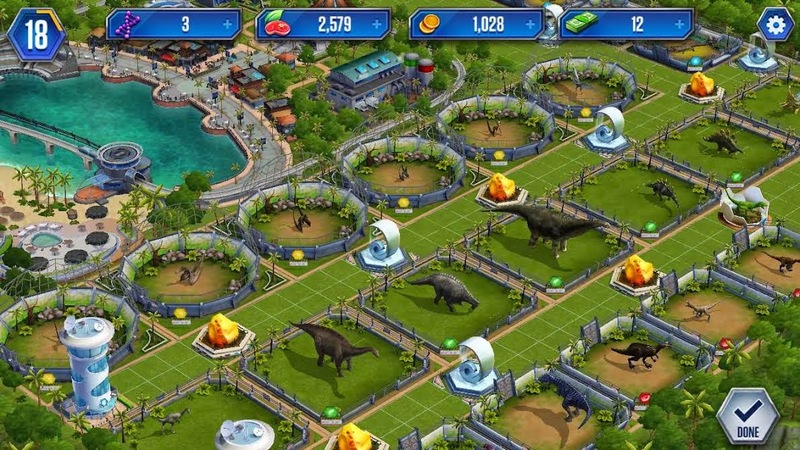 The main premise is that you are building the dinosaur park, managing money, food for the dinosaurs, DNA to create more dinosaurs, and you also need to level up the dinosaurs by feeding them. Throughout the game you are faced with challenges to fulfill, which earn you experience points, advancing you to further levels. If this zoo were real I'd have a problem with the size of some of those enclosures. 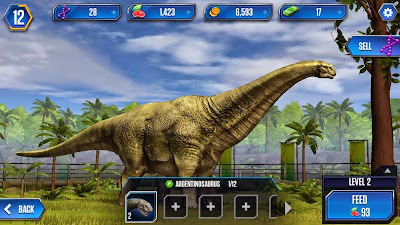 The other part of the game is based on fighting the dinosaurs against other dinosaurs for prizes! Now, if this were real life I would not condone this at all...but just like pokemon, my all time favorite game, it's not so I can freely say it is a lot of fun. (Shut up, PETA.) I am a big pokemon veteran, so this style of gameplay of turn-based combat I was able to pick up pretty easily. Also like pokemon, the animals in Jurassic world each fall into a "type", carnivore, herbivore, pterosaur, or amphibious. Each one of these types is strong to one other type, weak to another, and neutral to the third. This makes combat with teams of up to three require a bit more strategy than just simply bashing as hard as you can over and over. I learned that even though my dinosaur may be a much lower level than the opponent's, if it has a type advantage it can still easily win that match. 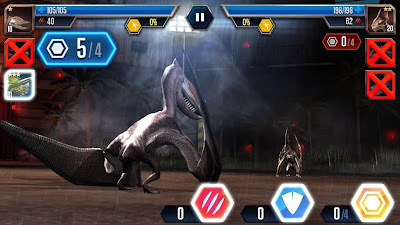 Fighting computer dinosaurs is required to advance in the game, but you can also play a random real person, who also has the game, for a quick match any time you like. When you feed your dinosaurs food, they will gain levels, just like in pokemon. The higher the level a dinosaur is, the stronger it will be in battle. 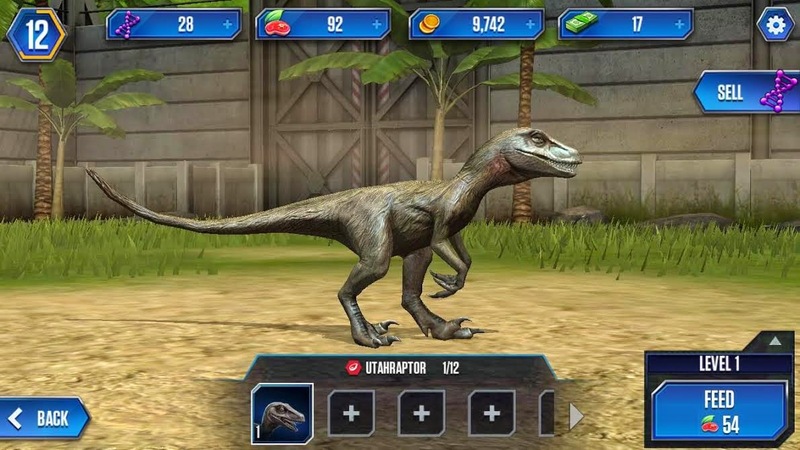 As you level a dinosaur, it will "evolve", changing its appearance slightly twice. Then the third and last time it "evolves" it changes its appearance drastically, ending up looking like an a complete monstrosity. My Triceratops ended up looking like Armadon from Primal Rage. I know what all you geeks are wondering. "But, Chris! Are the dinosaurs SCIENTIFICALLY ACCURATE?" I must say I had low expectations for the accuracy of the animals in this game, it being Jurassic Park World and all. The animals in this game are actually very hit or miss, depending on the individual creature model you are looking at, and there lot of them! It isn't like all the pterosaurs are inaccurate and all the sauropods are accurate, either. There is no pattern at all. It makes me wonder if different artists were doing different individual models or something. Let's look at one example I found after playing the game for a few days. Also keep in mind I am referring to the dinosaurs BEFORE they evolve for the last time, since these forms are clearly meant to be for fun. 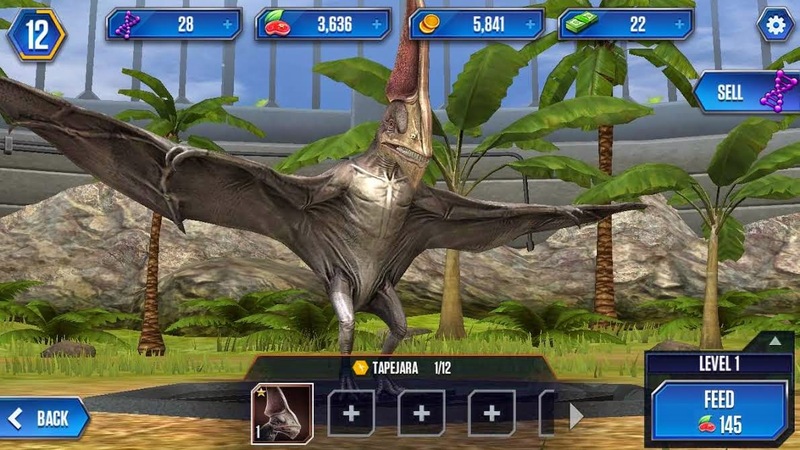 This Ornithocheirus (referred to as Tropeognathus in the game) looks really good! The wings are really long, the shoulders, chest, and arms are proportionally beefy, and the posture is good too! It even has the fuzzy texture worked in! Is this Jurassic Park??? Not bad at all, JP! Tapejara with teeth, no fuzzy covering, and bat wings. It's mildly frustrating how the same game can get one animal really spot on, but another, which is so closely related, totally messed up. This sort of accuracy inconsistency pops up a lot more in the game, too. What about feathers? Jurassic Park is notorious for ignoring the fact that many theropods had feathers. 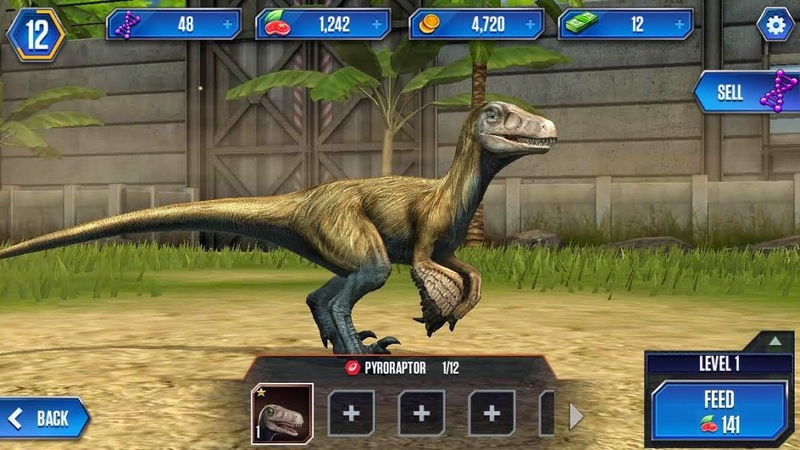 When I opened this game I was totally expecting to see naked theropods all over the place. Lots of the theropods are feathered! 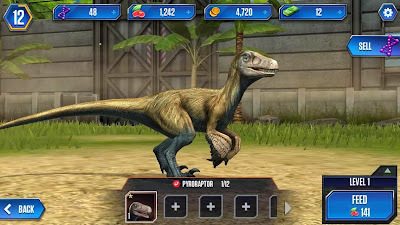 Jurassic Park game...with feathered theropods! Is this real life? I'm not just talking about a few wisps of plumage on the head, either. These guys have plumage all over their bodies! Now, mind you, not ALL of the dinosaurs have feathers that probably should, like Tyrannosaurus, for instance. But when it comes to dromaeosaurs, and even Guanlong, and ornithomimids, the feathers are totally there. My Pyroraptor...with accurate feathers. 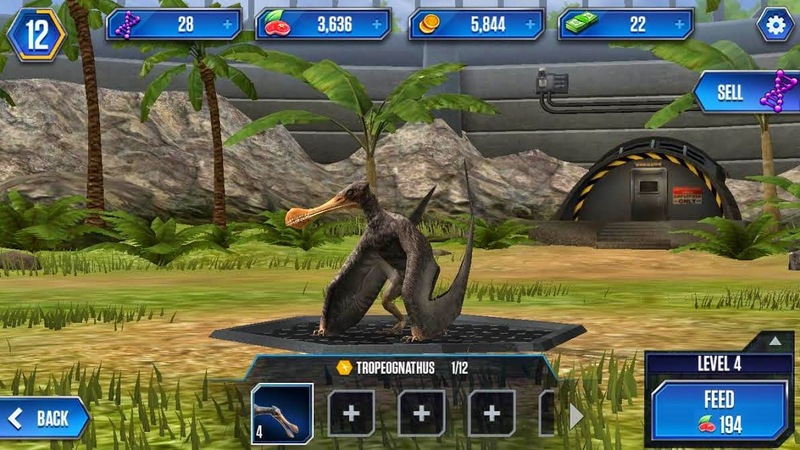 This is actually a Jurassic Park game? ...here is Utahraptor past level 30. Happy now? What about shrinkwrapping? For those of you who don't know, shrinkwrapping, in reference to dinosaur reconstructions, is a term coined a few years ago, which is used to describe when an artist basically just draws the dinosaur's skeleton with skin draped over it. It was very common for a long time (still is sometimes) and was the result of artists doing their homework so intensly by copying the actual bones, they forgot that living animals don't actually look like that. Well, the dinosaurs in this game aren't shrinkwrapped either. In fact, many of them are as beefy as ever! Of course there are still plenty of flaws. 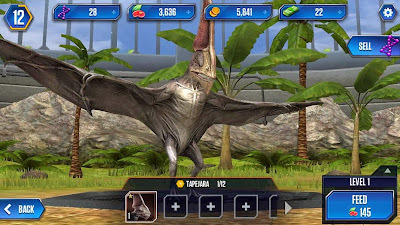 The wrists on the theropods are pronated the wrong way, the azhdarchids have wings that are too long, and the number of fingers and toes on a lot of dinosaurs is wrong, too. (the two-fingered Allosaurus was particularly upsetting) Overall, however, it is far from terrible, especially considering it is part of the Jurassic Park franchise. What's my final verdict? This is a really fun game. 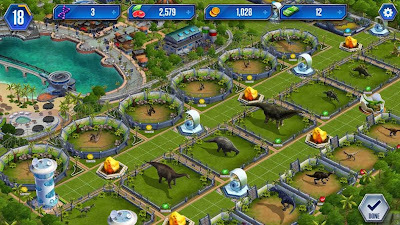 It is easy to play, not at all time consuming (you can get a lot done in literally a minute if you wanted), and it includes a great variety of prehistoric animals including lots that don't normally get any pop-culture appearances. It is also free! As you play the game it WILL ask you to spend money to buy booster packs of supplies and dinosaurs. Whether or not you pay is up to you. 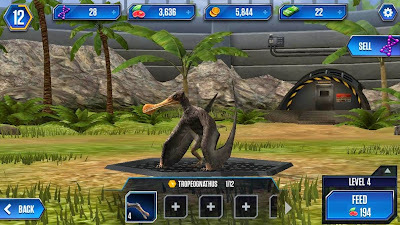 It is totally possible to play through the game successfully and get rarer dinosaurs without spending money, it just takes a little longer. 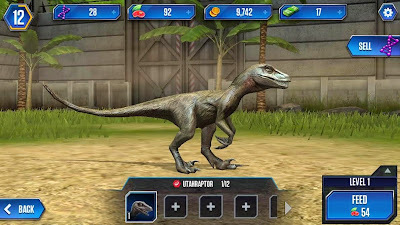 Like all things Jurassic Park, it isn't perfect with regards to scientific accuracy, but this game does come really close on some of the animals, which is saying a lot considering educational franchises like Discovery and Animal Planet get stuff way worse than some of this, and they are actually trying to educate you. If you end up downloading it let me know your thoughts in the comments below! I'd love to hear them!